Update on Lily: Our research indicates that the Lily has been discontinued and they are currently facing a lawsuit. More information here. We are leaving our Lily content here for reference purposes, in case you are interested in how Lily unfolded. The Lily camera drone is quite possibly the coolest gadget we’ve seen this year and will most likely make most wish lists next year. This drone can take video of its user from several different angles (or “shots”) by performing specific commands including follow, lead, slowmo, fly up, side and loop. One of the coolest features is that the Lily camera flies itself and there is no control required. So you can kayak, ski, run, etc. and Lily will follow your every move. 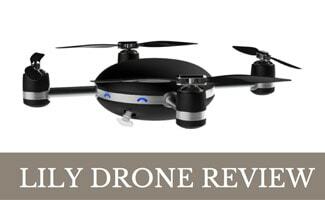 Read more about the Lily drone in our Lily Drone Review. Unfortunately Lily isn’t available for sale yet, so our Lily Camera Review only includes information found on their website today. No worries though, once Lily hits the market and users are testing it we will update our article with up-to-date pros, cons and more. How Does Lily Drone Work? All you have to do is turn Lily on and throw it in the air. Lily will then follow your every move as long as you are wearing the tracking device. The tracking device is worn on the wrist and gives you the capabilities to choose your Lily shot, take photos and it even records sounds. Checkout the video below to see the Lily camera drone in action. WARNING: Watching this video will make you want to order this drone ASAP! Learn more about the top drones that are currently on the market by reading our Personal Drone Reviews. Also, be careful to use your drone legally! Read up on the drone laws and make sure you know what is legal and illegal in your state. What are you most excited to record with your drone?